Within 250 miles of Wilmington, DE. 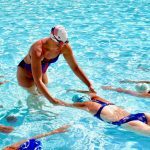 Your swimmer will learn at this high performance swim clinic how to blast off the blocks, into a powerful underwater dolphin kick, and breakout ahead of the competition with Olympic sprinter AND coach Brett Hawke! Don't start out your race playing catch-up! Learn technique for a faster start, more powerful underwater dolphin kicking, and an explosive breakout. Get an advantage every race by learning from Olympic swimmer and coach Brett Hawke! Start: Get off the blocks faster and with more speed and power by learning the techniques of Brett Hawke! Your swimmer will learn to set up on the blocks in a position that will allow them to explode forward. Make sure to be fuly engaged in the air as you throw your hands forward into a tight streamline. Your swimmer will learn drills and exercises that will help make them faster at this clinic! Under Water Dolphin Kicking: The fastest swimmers in the world dolphin kick off of their walls and breakout ahead of the competition. It's not as hard as you think. Brett will help swimmers improve their technqiue as well as commit to a number of kicks off of every wall so that they can imporve their underwaters now as well as in the future. Breakouts: Learn how to cary momentum from the underwater dolphin kicks into the breakout by timing the first stroke and staying streamlined. Your swimmer will practice keeping their head down and it'll make a big difference in their breakout! Observe the Brett Hawke demonstrate a progression of perfectly executed drills to achieve powerful, efficient and fast technique. These drills will be great tools so that you can continuously improve your technique. Take a photo while wearing Brett's medals, get autographs, and a gift from TYR Sport!